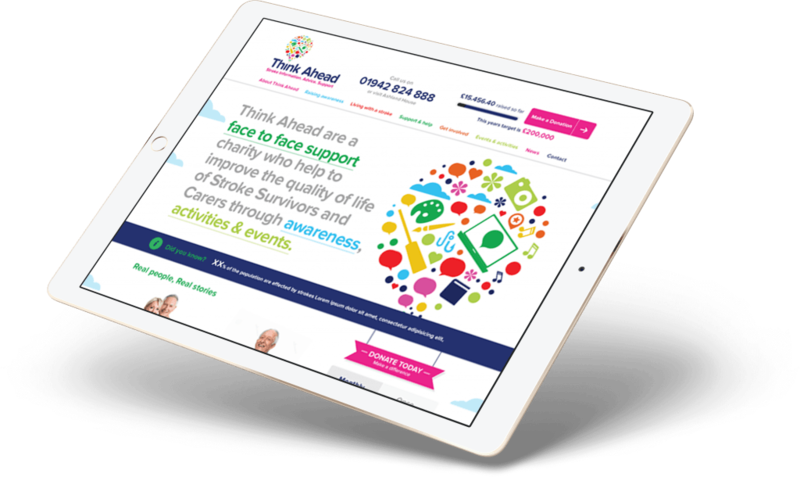 Think Ahead is a face-to-face support charity which helps to improve the quality of life for stroke survivors and carers through awareness, activities, and events. To enhance its mission of raising awareness and donations for stroke sufferers and their families, Think Ahead looked to the web for an accountable, scalable, and efficient way to boost donations. As part of Think Ahead’s bespoke web design and development, we adopted bright colours containing various icons, from paintbrushes to musical notes, showing the spectrum of services the charity provides. The bright colours and bold icons grab the attention of the viewer, giving the charity a memorable identity. A friendly, legible, approachable typeface was chosen to allow the logo mark to work across all of the charity’s marketing materials. We chose to add a tagline as a part of the logo “Stroke Information, Advice, and Support” to reflect the ethos of the charity. A brightly coloured scheme helped emphasise that the charity's aim is to bring happiness to stroke survivors and their carers. At the top of every web page there is a clear donation area along with the total money raised so far to encourage people to donate. With Internet access via mobile devices due to overtake desktop in 2014, it was essential the site rendered correctly across all devices. We built the website on a responsive framework, as this is the preferred method of Google, to enhance SEO potential.